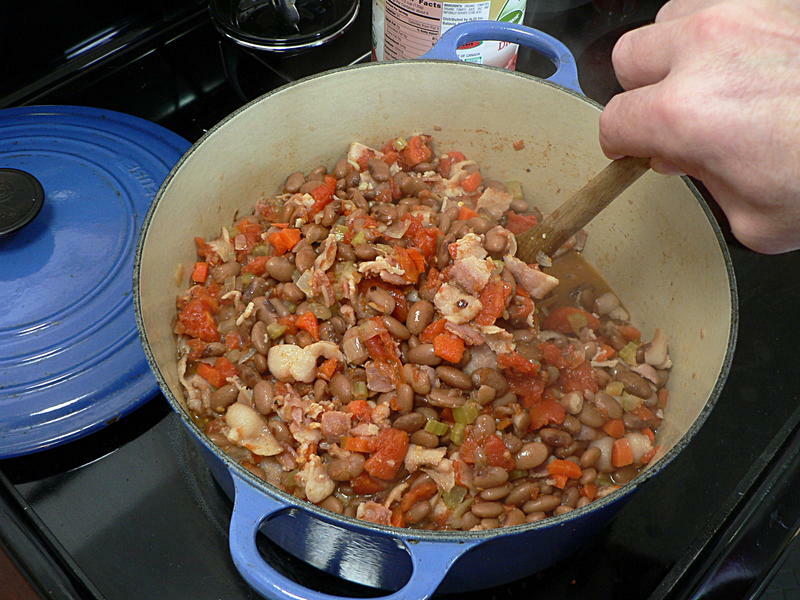 I first heard about Hoppin’ John from Michael Ruhlman several years ago. It’s supposed to bring luck in the new year. But because I’m not a traditionalist (I might have mentioned that above) I didn’t use the black-eyed peas. And I included Ruhlman’s non-traditional tomatoes. 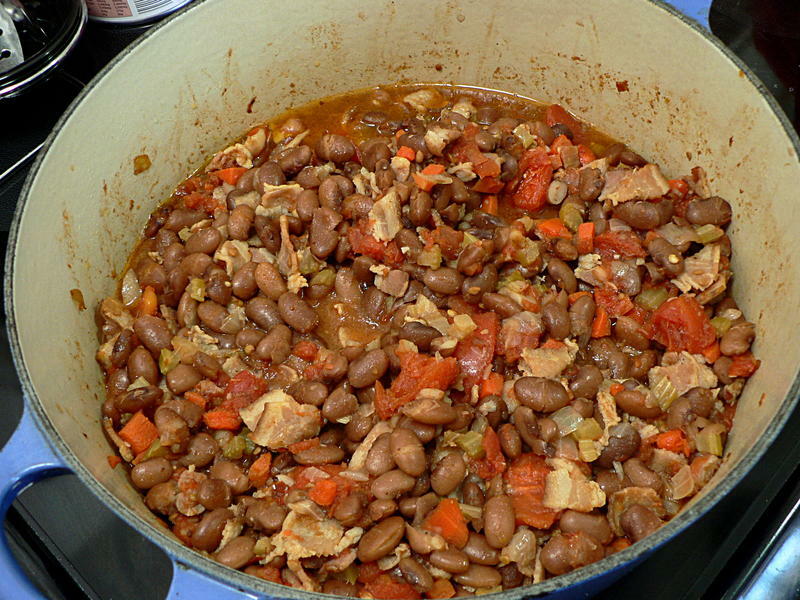 This is a hearty, one-pot meal that you can serve as-is or with rice or cornbread. 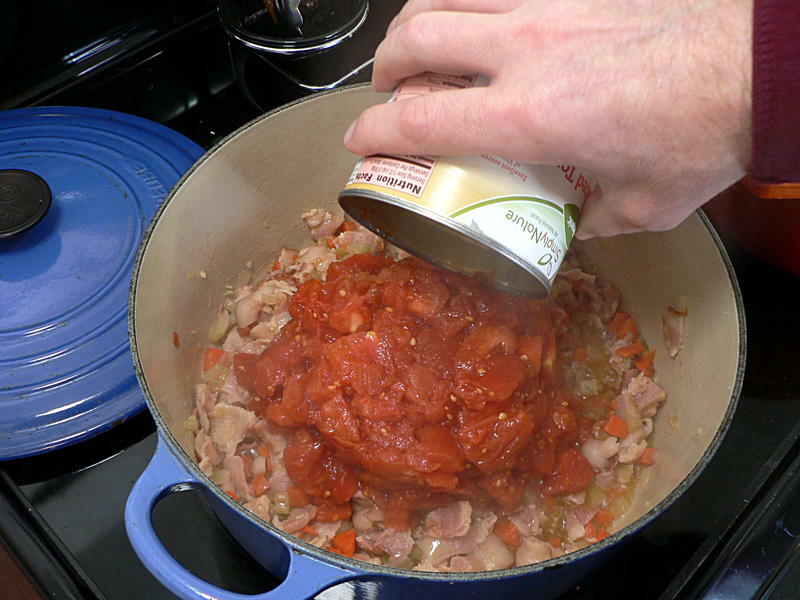 Like many soups, it’s better the second day. 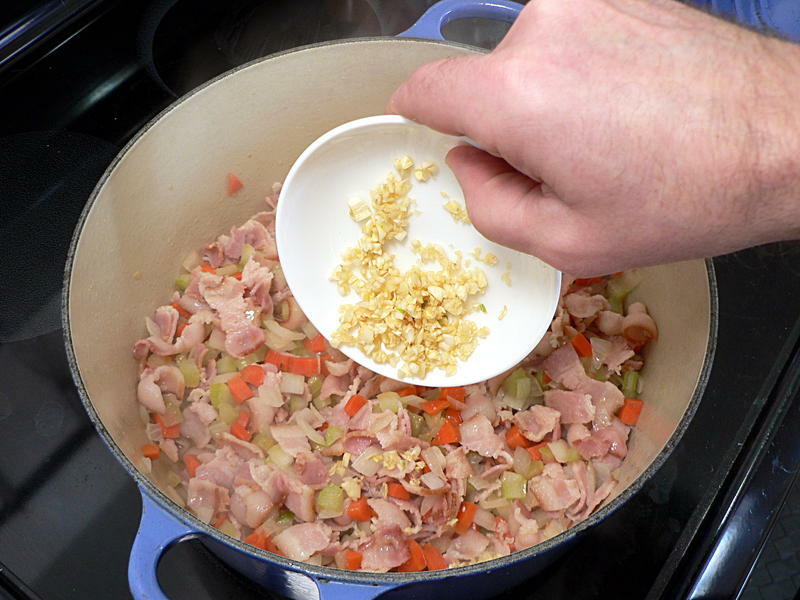 Make ahead, or make enough to have leftovers. You can use canned beans and save some time, but doing them from dry gives you the chance to put some flavor in them. In a small pot, boil 4-6 cups of water and add the beans. 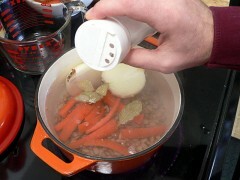 Add one of the onions, cut in half; two carrots, cut into long pieces; the bay leaves and two teaspoons of salt. Put the lid on and put in a 250° oven. Dice the bacon (it’s easier if it’s still slightly frozen) into bite-size lengths and put in a large pot over medium heat and cook until lightly browned. 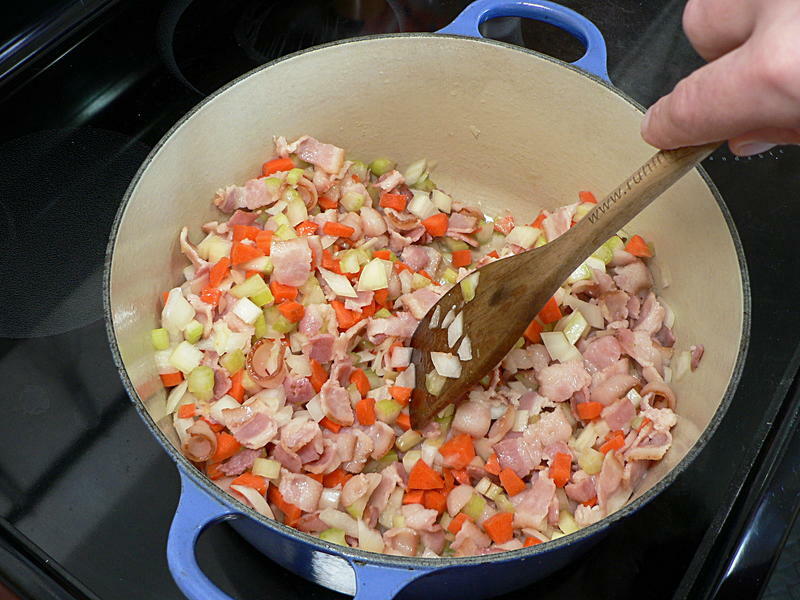 Dice the remaining carrots, the other onion, and the celery (this is a mire poix) and mince the garlic and add to the bacon. 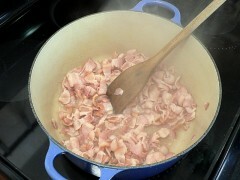 I should have waited a little longer than you see here, the bacon stopped browning once I added the veggies. 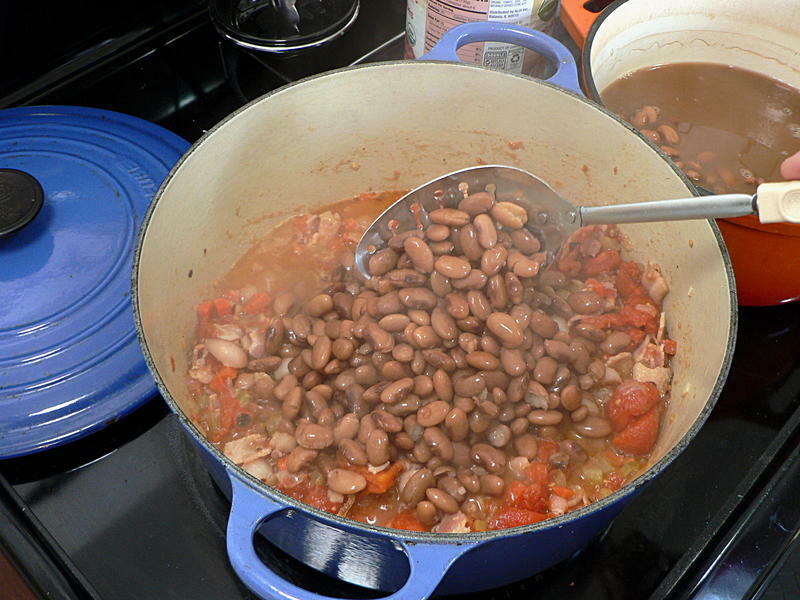 By this time your beans should have been baking for about an hour-and-a-half to two hours. 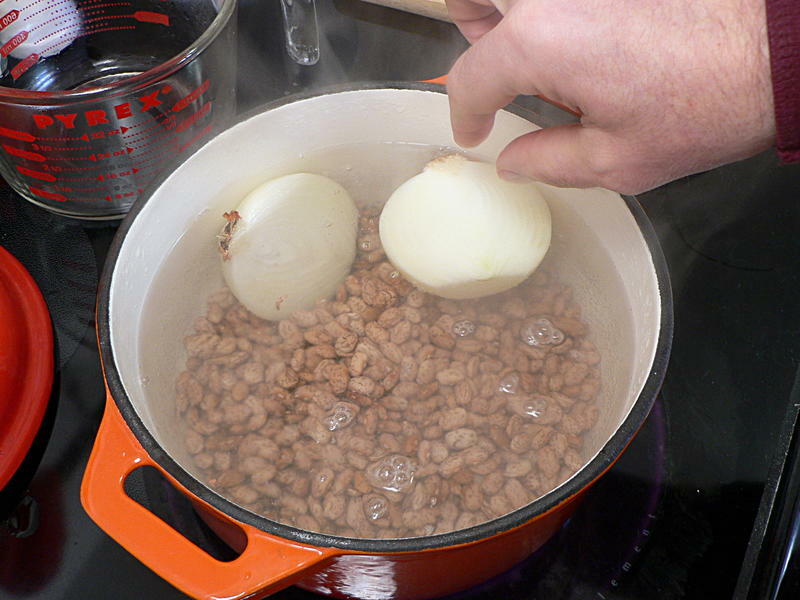 Check and see if they’re cooked all the way through. 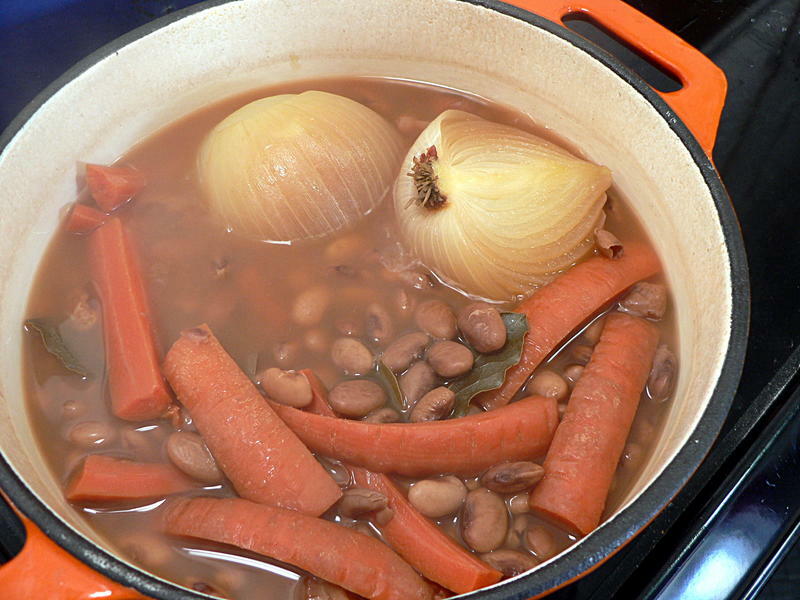 Pull out the bay leaves, carrots and onion. 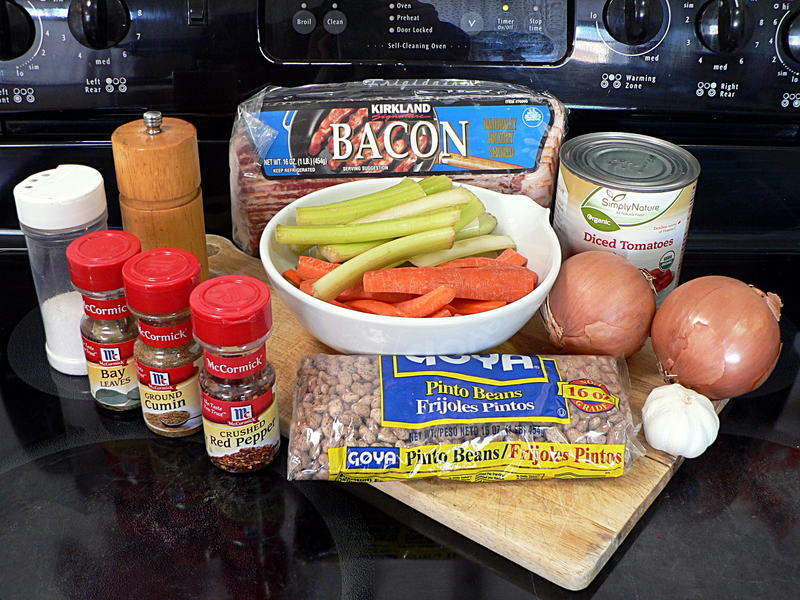 By the way, these are already an excellent side dish right here. Set that pot to the side. 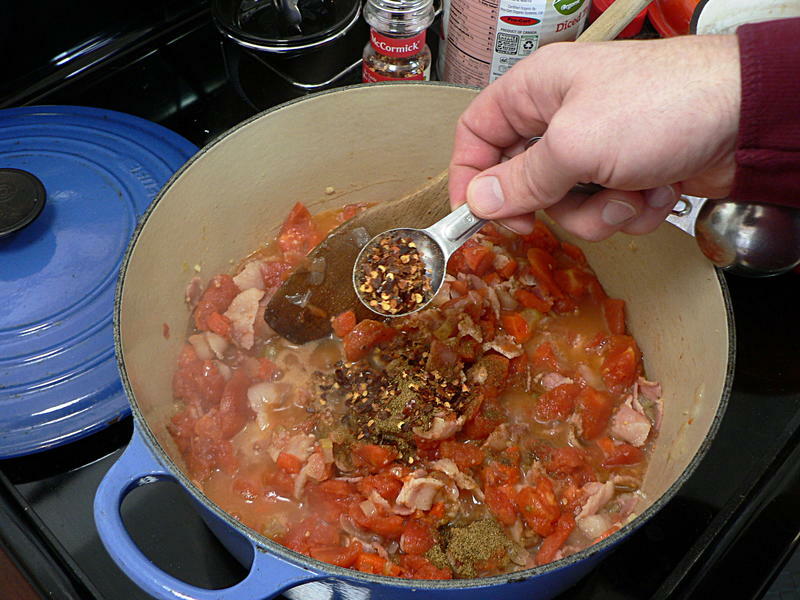 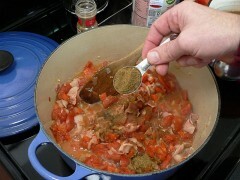 In the large pot with the bacon add the tomatoes, cumin, red pepper and black pepper. 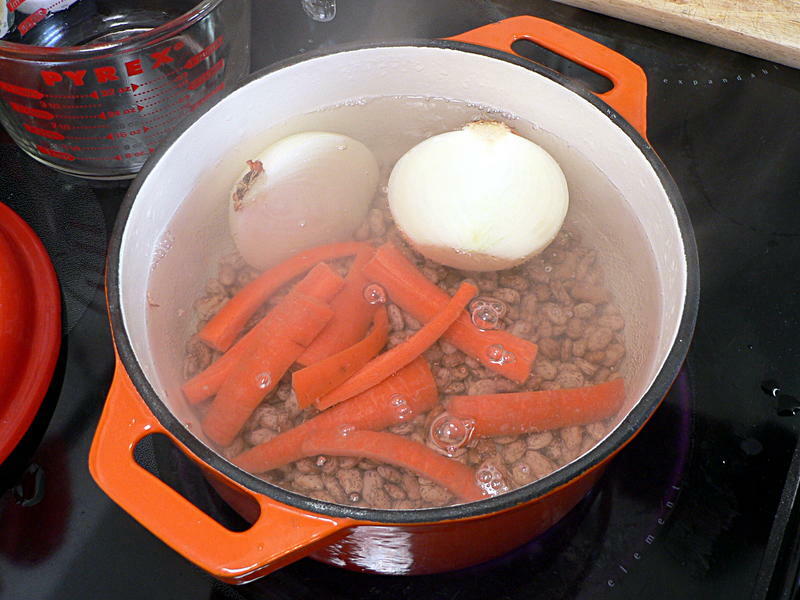 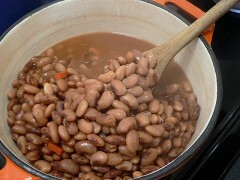 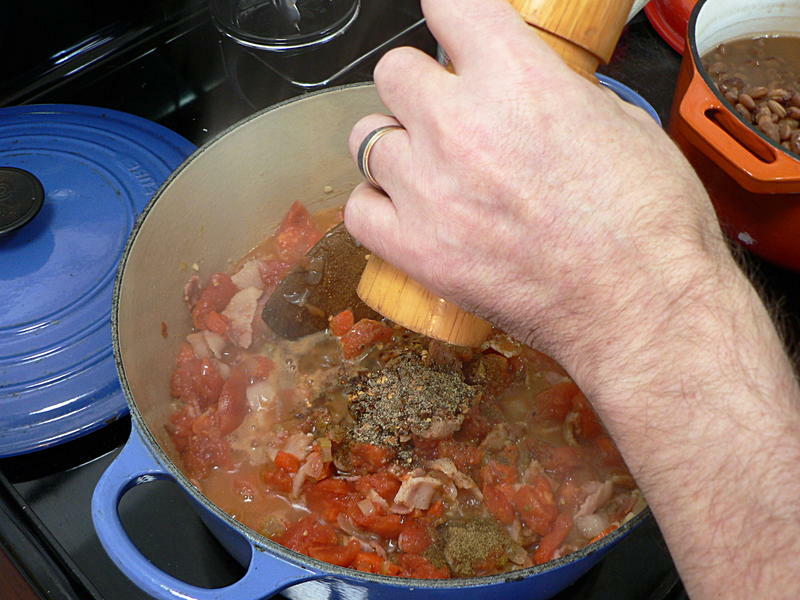 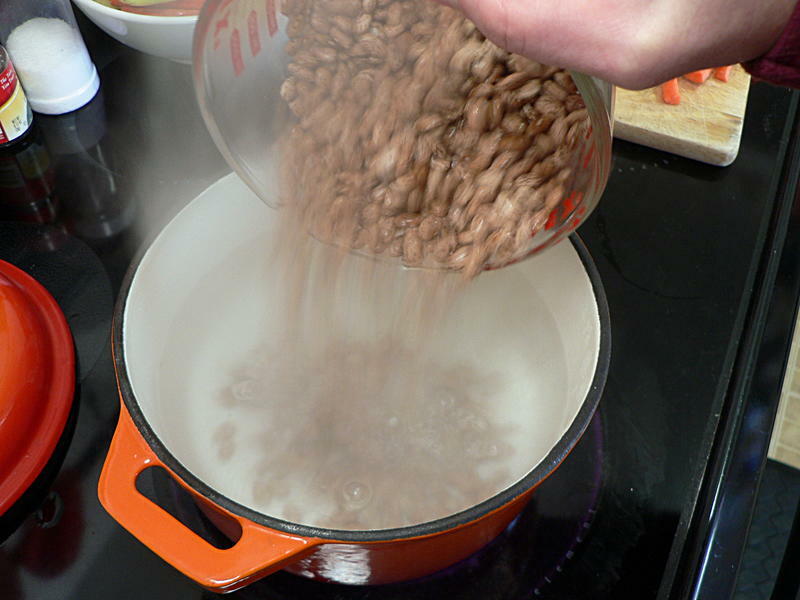 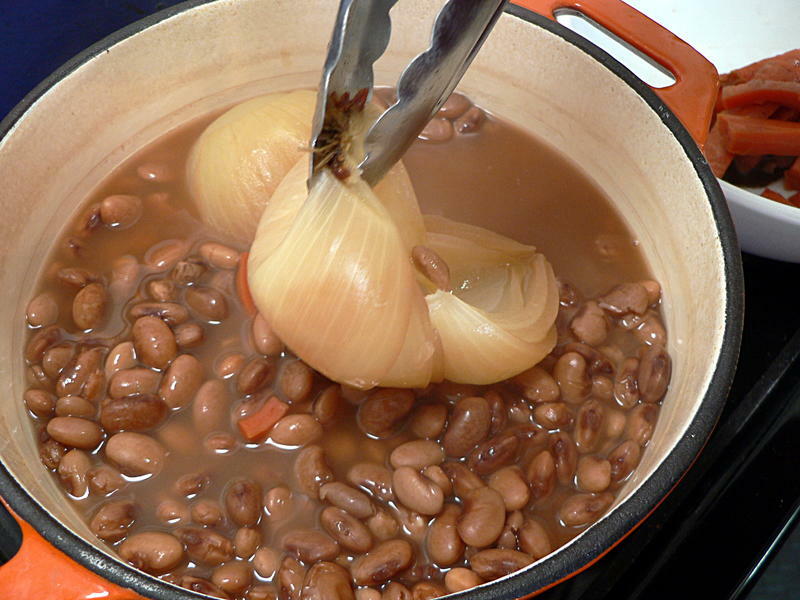 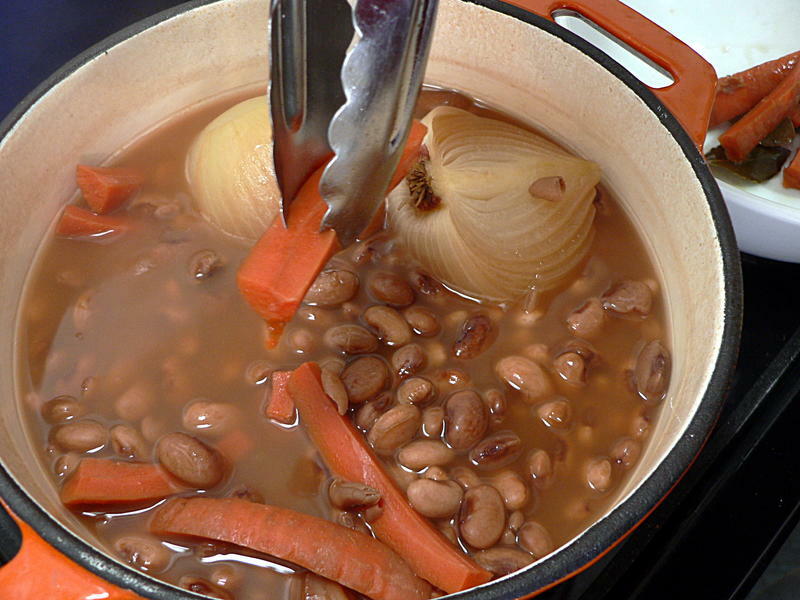 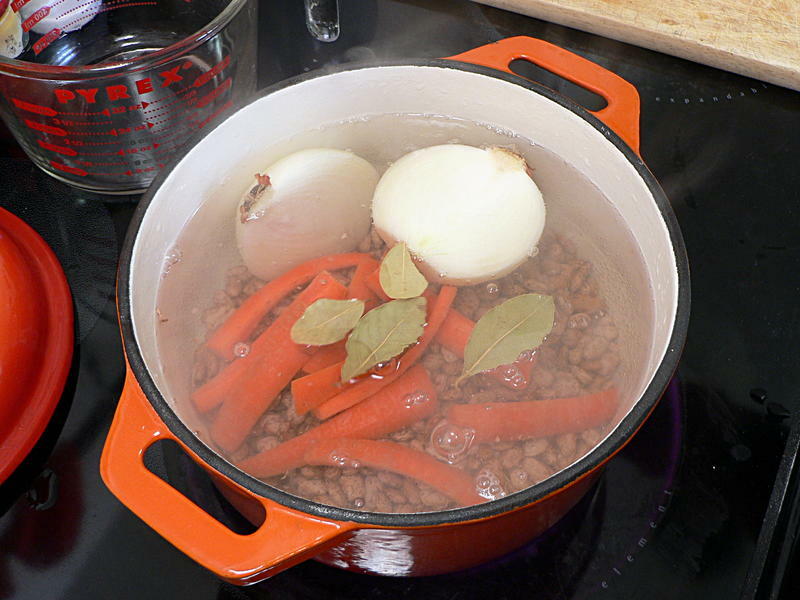 Using a slotted spoon, scoop the beans into the large pot and stir them in. Put the lid on and put in the oven for another 1-2 hours. 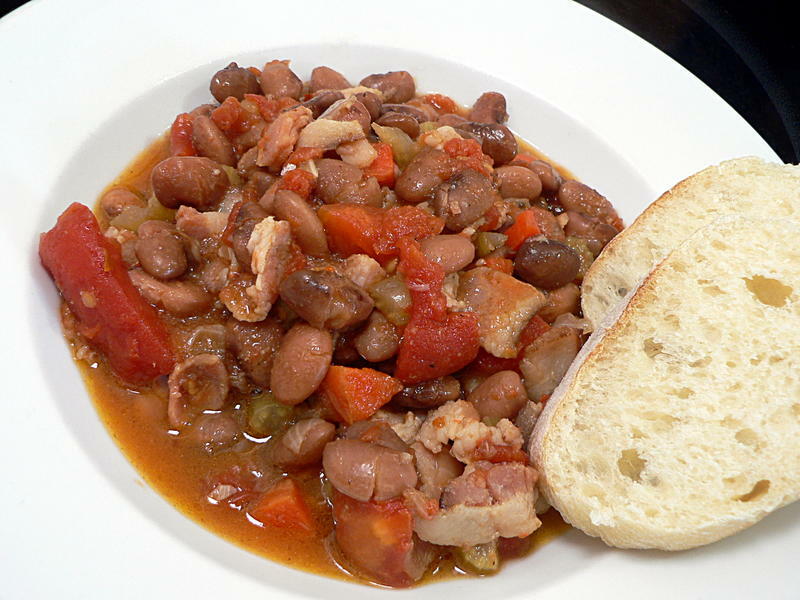 Serve with cornbread or crusty French bread. Maybe over rice, or a side of greens. In a small pot, boil 4-6 cups of water and add the beans. 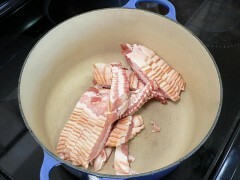 Dice the bacon into bite-size lengths and put in a large pot over medium heat and cook until lightly browned. 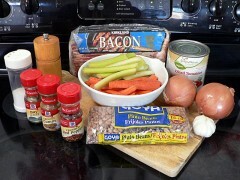 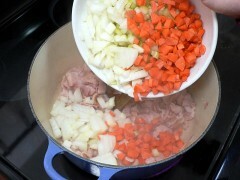 Dice the remaining carrots, the other onion, and the celery and mince the garlic and add to the bacon. 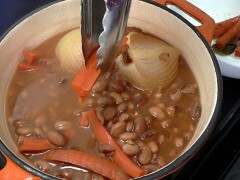 Check that the beans are cooked through. 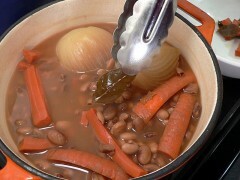 Pull out the bay leaves, carrots and onion. In the large pot with the bacon add the tomatoes, cumin, red pepper and black pepper.